Day 1: Chengdu, Wolong. Morning transfer to Wolong (3 hours 30 minutes). Check in Wolong Hotel and have lunch in the hotel. In the afternoon visit to the Giant Panda Research Base, financially funded by WWF (World Wildlife Fund). 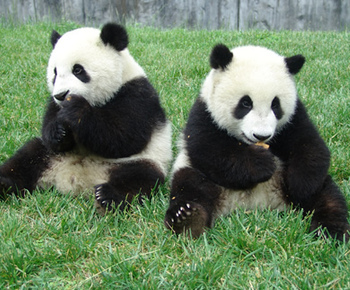 There are about 60 panda bears living in captive for the purpose of studying their breeding and living habits. Then visit the Giant Panda Museum. Includes: (L). Day 2: Wolong, Chengdu. Today an excursion is made to Hero's Valley. Hiking the mountain (1 hour 30 minutes) to the valley to see the natural surrounding of the area where pandas live. After lunch at local restaurant we proceed to a minority village to visit Qiang nationality people. Native Qiang people is an ancient minority nation in China migrated from Northwest China around 770AD. The village is well preserved with its primitive style. Stone fort-like houses are built along mountain with brooks flowing through the bottom of houses. The houses function as a residence for living as well as for defense. Walking in the village is like walking in past times. Transfer back to Chengdu. Includes: (B), (L). - Luggage Transfers between airports and hotels. - Gratuities, Tips to guides or drivers.